oil on canvas, 86 x 60"
oil on canvas, 114 x 25"
oil on canvas, 114 x 37"
oil on canvas, 84 x 60 1/2"
oil on canvas, 90 x 72"
oil on canvas, 74 x 92"
oil on canvas, 110 x 19.25"
oil on canvas, 100 x 70"
I want my work to become part of a mystique, you know -- you’re exposed to the experience. This is from a recent note: "Planes and straight lines do not exist. Physics can denote the continuum. It cannot invent it. The high-frequency sound has always been there. The tonality is only pattern discovered in principle. The universe only alters itself in our minds. Creativity is a tuning into the universe and not to alter men’s minds." I ask you if I’ve altered your mind, I hope. JH: Today we’d like to concentrate on your work. And in order to do that, maybe it would be a good idea if we went back to your early work, and if you could tell me what your early work was like, and perhaps refer to some specific examples. [They replay a portion of the earlier tape]. LB: First trip: 1954-1955. After the workshop. JH: This was when you spent a year on Majorca? LB: That’s when I spent a year in Spain, a sabbatical year. . I think there is where I first really found myself. JH: What had you been doing before that? LB: Well, I was just a painter. But I had, you know, completed my education, and all of that. And after the War, I went to various countries where I was apparently a student. You know you have it in the history, Italy, you know, as well as various art kicks in Spain, mostly Arabic. But there in Spain, I discovered my own isolation. I was equipped with my formal education as an artist, by the university and other places -- Mexico City -- and college, and Art Students League in New York. But I could see that all of that was behind me. And I had these years in the Art Center’s workshop, where I was in contact with the artists of Washington, but more importantly, with people like Morris Louis, and with de Kooning, and New York artists. So I’d absorbed a great deal. The great question in my mind was whether I had found my own voice. In Spain I came to realize that I had. [break in taping]... always in your mind. But you’re an artist when ,a somewhat different definition, than you recognize in the theories. [laughs] And it was there that the people I was with -- people like [Creeley], the poet, and others, you know I had respect for -- and I found them looking at me and asking me questions. And [both laugh] I had a lot of knowledge accumulated from poetry. Poetry was a rather important source for me. I suppose I always had a kind of romantic sense of life. That’s a confession [both laugh] that I seldom make to myself. But I think there is a real, a very clear value in the poetic imagination; that it is in touch with those subconscious feelings, memories, thoughts that affect and influence and shape your work and also accounts for the work itself. But I don’t think I could have taken those leaps which have no proof that I was doing. [both laugh] It seems at times that those particular leaps are supported later by proof. And this has happened, of course. Really. You seem to be recapitulating what other minds have thought. Fortunately they’ve put them in writing. So at the same time you see the mirror of yourself. And then you get a marvelous kind of confirmation. JH: Was this happening in Spain? LB: Well, I was talking of a fairly consistent pattern after the years when I - - it comes from, well, I mean, I suppose the supportive evidence for what my imagination found was in -- well, such diverse sources, you know. Literature, physics, anthropology. Form, for me, at that time in Spain, and this is an example of the in-spaces things got, I’m trying to think, you know; sometimes my memory really plays dirty tricks on me, something that is very very important to me, names, like that. JH: What is the title of that painting? LB: In-Spaces of Land, Sea and Sky. I did a series, in Spain, of those in-spaces. My thought was that the sources, I was very much concerned with source. I still am. I thought the source of an idea could be mythology. Look at mythology for the source of contemporary thought, that is, we had a history. Your personal history only parallels it. And of course, the influence of psychology, I did some work in psychology, in the Army I was a psychologist and, yes, I have the degree; I almost got into it; I almost wanted to take my graduate work in psychology after I came out. JH: Were you doing clinical work? LB: I was working with clinical people, I was working with psychologist and psychiatrists, as an artist. JH: In a sort of art therapy? What I mostly wanted was just a huge barn! But that was a very important year, I think. well, Arthur had a house nearby, and a couple of major poets, and there were just a group of about four or five of us, really marvelous. And we were sort of isolated from the rest of the Palma culture. And I was saying, the Consul’s wife had left me a studio, it was the maid’s room over the kitchen and it was about as big as a huge closet. And Arthur and I covered the walls with paper so we wouldn’t dirty up the place; and we tried to paint in there and it was no good. So I got out on the hill. And I became a major painter. [both laugh] And I set my canvas up against a wall that must have been up there in the time of the Moors. And I was surrounded by just the sky, the sea below it, just endless space. And that’s where I felt comfortable. And I’ve been living in that space ever since. JH: The title, is it, "Inspaces" as one word? LB: Yes. The Inspaces of Land, Sea and Sky came from, the notion came from the things I am telling in terms of source. But Grard Manley Hopkins discusses star-centering in his, well, Introduction to his poetry, he writes of his method and ideas. This notion of star-centering was also inherent in the idea of source. But in star -centering, like in his poem on Mary, The Air We Breathe, the living nature emanates the spirit to the total universe. And there were other readings, from other people, that involved such thinking. This became my space. It still is my space. De Kooning said, you know, each of us -- we once had a conversation about the kind of space each of us feels. And, you know, his space is different from my space. His space is close to his body, and where is it? And mine is "out there." But you don’t know these things, they have to develop in the work. And when the work tells you these things. And I have -- one of the reasons I was writing -- you know, I don’t write long things, but -- to trace the development of my thinking. Because the thinking is the result of the work. Just as the truth is the told in a dreams. [laughs] But conscious statement of what we call the dream is unreliable. So I’ve tried to find what was, you know, behind what I thought, and what is behind what I see, and what is behind anything. I went to my studio -- it was a dead bird, underneath it. The bird had died in the winter [I was painting in the winter]. I let the bird become the painting. That was the source. The bird became a sorce later, I painted another painting, recently -- the one when Golda Meier died, and at extremes of both paintings there were dominant golds with yellow. You see, it tells me things. JH: Could you elaborate a little bit on how the bird became the painting? JH: You acquired that already in Spain, or is that something that developed out of that period? LB: Oh, well, it started in Spain. I don’t know, I could talk about these things bird or Golda Meier just struck me right now painting. And they both dealt with that, you know? I am not a formally religious person. I’m very much against dogma of any kind. So how am I to know, if I reject dogma, what I really believe? [both laugh] That’s where I come. But then, you see, if I were to form conclusions from my experience, then those conclusions would be benefiting of course. Well, what it meant means to me at the moment is that, "God, it isn’t empty." And beyond that I can thank the development. But I’m so glad it’s golden. I don’t know why I’m glad, but I am. LB: No, I didn’t know it, didn’t know it. You see, this is the kind of knowledge I trust, the kind which thrusts itself upon you, beaks through your consciousness until you believe that inner sense. Now I believe it, you know, I’m a dummy, it takes a long time. But if it’s so difficult for you to see yourself, you have to work so hard at it. What about the rest of the world? They have a harder time. But there, of course, is the whole history in the development of my sense of what color is. And, well, I think you hear some pretty fanciful notions about it. There are many. Of course, color doesn’t exist. You know? It doesn’t. Because if weren’t’ for the light out there, what is our color? So what we see is a relationship between a cosmic existence and our self. This sounds awfully spiritual, doesn’t it? And that’s what I’ve been accused of, of being spiritual, and animistic, and all this kind of nonsense. But that isn’t true. I think that most of the world is mystic and I’m a realist. You see, I guess the artist has to be defiant a little. JH: Yes. Did you continue this exploration in Wales? LB: Well, yes. Because, well, during that next 10-year period, we spent about half of it in Europe. And again in Wales, there was a 2-1/2 year period altogether; there was a two year, and a thing in 1967 of six months. The dates are there somewhere. But I came back to America and then returned, you know. We had this thought that we were going to live there finally. And we bought this house thinking we could rent it. We had one fiasco when we were away for a year and, no, it was that 2-1/2 year period. It was rented for a year, then it was empty for 1-1/2 years. And we didn’t know what was going on. We came back and the front door was open. And the police said, Well, ... .worried! Nothing was taken. But you can imagine the kind of imagination you’ve got to draw on, I tried to call people in America to check the house. Well, we were hoping, in those days, the 60s, it wasn’t simple renting a big house like this. So we’ve ended up of course, living in it. But, so that was a back and forth thing too. In Wales, and that, incidentally, [break in taping] In these Spanish paintings I was of course influenced by the mood of Spain, which is dark. And I was very restrained in my use of color. I remember painting one that I called Gray Green I Want You Green, that’s from Lorca’s poem and I refused to put green in my painting, but I’m told the painting took prizes here. And then I resolved to have some green. But I had to justify it in terms of that inner experience The green, you know, I just let color out gradually. By the time I got to Wales, this is a Welsh painting, Wales is there in temperature. It’s another world compared to Spain. There is a kind of efflorescence in the light, like it were actually rainbows. And it’s partly because, I believe, it’s because of the water vapors in the air which splits the light. And the St. David’s Cathedral is surrounded by rainbows all the time. I, you know, when I came back to America after that, I wondered, "Is this my imagination or was it real?" When I returned, the very first thing I wanted to find out was, "Is it true?" You see, I wasn’t believing in myself. I checked this later on in that same years, and Vermeer saw the same way. And I took a magnifying glass and I studied the edge so his figures where they existed in light, and he had broken the edges... But this was not true of de Hooch or any other artist of the period. Well, you know, I felt this was true before I found out, I almost cried. But certain artists, for them color has been a language. Turner, for example. And, you can almost read that language. What is the title of the painting? This is ... Is there a title on the back of that? Not at all? [male voice in background says "It says "Untitled: on the back"] Incidentally, what is that title of the Welsh painting here? I remember there was a, oh, I know now. It’s called The Scent of Gorse. There was an old lady, almost 80 years old, or 80, I don’t know, used to come -- we were living at the top of a cliff, and to get there was quite a job. It was so high, we used to look down on the road. And she’d come up there with a cane to watch me paint. She was the one who interceded with the people of the Cathedral, the Dean, to show my work. That was the show I had there in the Bishop’s Palace, which was a kind of 14th century ruin, you know. But, and the people came, thousands, from the whole countryside, form the towns around. The BBC camera. They wanted to know what these Americans were doing up there for two years. But that, she named that painting. She walked away, and came back and said, "Oh, I know what it is. It’s the Scent of gorse." But you see that quality as compared to the particular gray and dark black . But each culture seems to have its own quality of light and dark. Greece: in Greece, there was always blueness. It was a place where philosophers could think with clarity. The earth is hard, and the sky is clear. And Jerusalem is beyond me. It was too mysterious. There was a violet in the air -- I couldn’t catch it. There was nothing I did in -- I was there just a few months, but nothing I did there was satisfactory to me. That sense of the miraculous is certainly true. And also, of course, there is the drama of the tragic, river city -- Jerusalem was split in two. Right through the middle of the street there was barbed wire on each side. And the Jordanian soldires were facing the Israeli cultures at the distance of one street. And you’d walk between. And if you went too far -- my wife almost got shot because she went over into Jordan, she took the wrong path or road, and there were facing her with guns. We lived right at the edge, in an old Arab relic of a place. There was a courtyard beneath a stable of horses, and there was not heat, and no toilet, nothing. I used to sleep on a stone windowledge about that wide. But the experience was important to me. That quality of the violet later came back into the work, in America. You know, these things have been supported by other places that I’ve been in and other kinds of -- I started to tell you downstairs about that dream and when I painted the first in the Cathedral. I went to sleep that night and woke up -- well, I had a dream that I was holding -- see, the shape of the canvas was like this, and the edges were green, like light shining through, and within it is a kind of quality of luminescent violet. And I dreamt that I was holding a goblet of sacramental wine to the light, and I saw the green edge of the glass, and I knew it was sacramental wine -- I smelled the red wine, in the dream. So I woke up, and I was still smelling the red wine. And I’ve had dreams like that, you know, which, so that I felt that what I was doing was supported some place deep in my experience. I came to trust this, more and more. And there has been a quality, I think, of an involvement with -- oh, I don’t know what to call it -- something sacred, I think. And I’ve endeavored to be in touch with it, whatever it is. But somehow within that experience, is that much an advantage. And I did that series -- first, The Dualities. Always I was endeavoring to find and bring everything together. Like, in this one, that force of movement which is endeavoring to move itself -- you see, you don’t know these things until later. Look: it’s completed there. But the turning of these two forces -- these turning down, these turning up -- there’s always that interplay, you know, a reciprocal movement. And I got it from the sea because Nature’s always seemed to me -- and there is no horizon, really; it’s like a twisting rope, you know -- really twisting the sea and the sky together. JH: You really get that sense. LB: Yes, yes, -- this is the way you find things really are. There is no line there, you know. It’s the movement of the earth and the movement of the sky what we call the sky. And so, always that sense of continuum,impression. I used to listen to Eastern music a lot when I was working, because that has the same quality, you know? It deals with a kind of continual sense of time -- not like our time. We chop up time into pieces. I do too, you know. This is when I came back to America, and it was around '64. when I was drawing these experiences of Nature, and starting to the "Harpstrings" things. Harpstrings, yes. There, sound was important. I got the plucking of those string vibrations as they move back and forth. JH: Does this one have a particular title? LB: It’s called, Red Harpstrings, I think. Ida had wrote three poems about them. My problem in America, then -- I had a hard time for a few years, incidentally, because I wasn’t in Nature. I was trying to find that meeting between what I experienced in Nature and the city --bricks and -- you know, it was hard. And that’s why I began to go toward -- well, toward clean shapes. But I still had top liberate those shapes break that chain, so the edges, of course, are soft, you know, and they’re a continuation, and there’s the vibration back and forth, you know. There’s like the sea again -- the incoming-tide-returning thing, again. So those forces still existed. And I finally resolved these things. and I tended to do really tall things. There was somehow a compromise between the hardness of the city and the freedom of the Nature thing. That you’d held in your memory. Carried with me. And well, it wasn’t until 1970 -- we were in New York -- I had gotten a grant, a national Foundation for the Arts things -- and we’d come up to New York, in '70,'71, and worked in SoHo. And that was the time of the year when I won that show, you know, it was not long after that;at the Stachlert[sp] Museum. LB: Yes. I was going to put tape down to introduce that linear thing. And she said, "Golly, it looks good without it, you know?" So, I said, "I don’t know how to complete it," you know. So, anyway, I let it go for couple of days. And then I realized I had to solve it. And then I did. I worked on the idea of surrendering -- I finally surrendered the last line. And then I found that what I had to do was organize energy, light energy. And then I went to the unity, which was a kind of a resolution of the organized energy. I had a show -- that was the Corcoran show -- and I wondered, "Gee, what comes beyond this?" you know, once you’ve reached total unity, where do you go next? (voices over lap for first few seconds) I was using a single enveloping space. I was contenting a single enveloping space, see. I was considering such problems as the proportion of the little width tot he height, I was trying to qualities like verticality in relation to my body and what the meaning of verticality-horizontally was, I mean in terms of proportion and, say, size. I was dealing with the filed. But -- there were a lot of problems that I had to work out. But having resolved those, I my canvas, and somehow I felt that I had to enter, and in entering the canvas, discovered within the canvas what it contained. And sometimes it seemed almost as though I was looking at something in the distance as being in a woods, in a green woods, and seeing an illumination beyond. I began to deal, more and more, with different degrees of visibility, and contending with the notion of the threshold of perception. so that subtlety, and the almost visible, sometimes was in contrast to the clearly visible. So that there was a range in the visually perceptive qualities of the work. I’m still in that, you know. That is still an involvement of mine -- the discovery of what it presents. Sot hat I’m still in the notion of source. But it seems as though there are levels, spatial levels of existence, and I think it becomes relatively clear in, let’s say, that painting, which has been called Coronation. So I think that what I want to do is to be able to establish levels of light. But of course, in making a painting, the depth, all depths, have to return to the surface. Otherwise I would simply violate the notion of unity, which of course I was involved with -- just as again, I go back to that notion of the shell, or any cosmic phenomenon. And -- this is the way Nature is, this is the way -- I’m, I mean , I’m very close to that notion about our lives, but I’m afraid of it: I don’t want to form an conclusions. But it’s quite interesting. you know, you can find reference here and there -- you find it in Shakespeare, you know. The circular shape of our lives. So that’s what I’m about, now. And to find light within light, or to find darkness within light; and light within darkness. You know, you look at various paintings, they take on these different qualities, these different searches. And I’m much more sure of myself as a painter of light no matter what. And color tends to have a different meaning for me. You know, I’ve always had a feather near me in my studio for years and years and years, form way back in Spain, way out in . Somehow I felt that in that feather there was some secret. And when I had difficulty, I would look at the feather and find energy. JH: You said that to me, last time. LB: Did I? Yes. But there’s a certain mystique in that feather. You know, it could be something else, but to me it was the feather -- the relationships to the sea, to the sky, to everything. But it was in a sense Nature translating matter to spirit. Because the feather is formed by the air through which the bird flies. It’s shaped by the air, and it emanates from its stem into the thinnest of the edge. And its color begins from within itself; it is not cosmetic. I’m very much opposed to anything which doesn’t originate from within itself. JH: Would you say that was the difference in your work and, say, the Washington color painters? LB: Yes, very much so. I’m NOT a Washington color painter. JH: I know, I know that you’re not! LB: That is such a confusing idea. LB: I mean, it’s as though I learned my lesson in a certain school -- the color school. But I didn’t. JH: No. And theirs are applied, more or less. JH: The viewer’s experience of your painting, then, is bound to be far different than, say, your own. LB: A lot of my confirmation comes form the response of the viewer. Not in the things that people say, because as I said people have difficulty forming conclusions in looking at the work, because always seems to evade them. But that’s my purpose. LB: But what I do get is this -- whop, somatic responses. I’ve actually made one guy run out of the house -- he couldn’t take it. He’s a rather famous guy, too. But he -- well, he thinks the world of the work but he just couldn’t take it. And other people have cried, you know. More recently there was an artist here who works in New York now, and this woman actually came to tears and she said she had the same response only to one other painting in Paris on her recent trip. And that was Coronation of the Virgin by somebody. And that’s why it’s called, Coronation. JH: Which one is that? JH: ... the notion of the light being audible to the viewer: is that one of your making, or is that something the curator of the show dreamed up? LB: Well, that was one that I, I really admit I tried to resist. JH: It didn’t sound like you. LB: It was not my idea. But I won’t go into that. LB: But here is some justification for it. JH: It doesn’t seem consistent with your own thought on your work at all. LB: Very perceptive, what you say. I would much prefer But here was, well, in ancient Indian art here is that idea -- that originally we had sound and that, well, light came from sound. I know that one of the interesting things in my mind was that -- what was his name, the architect --Louis Kahn. In designing a building, he would begin with silence and sound. His chief preoccupation in any piece of architecture was light, and he said it always began with silent and sound in his imagination. So that a -- that -- I always forge the name of it, begins wit K -- but he used long barrel vaults, you know, he had that long sounding thing. So that the enclosure of the architecture really is an encapsulation of the light. And of course these are things which are very much in my thought -- the notion that a painting encapsulates the light, or like in Vermeer, in his painting of The Pearl, the pearl which is in effect some of the light. It’s simply that I am dealing with the architecture of the rectangle and its flat surface, and somehow I have to make that a common existence between this spheric form of vision and the architecture of the canvas. So there is some justification for The Sound of Light. But I would prefer to call the exhibition Ten Years of Work or whatever. LB: I’m very cagey about titles. I need titles, because that’s to recognize my own work -- you can’t keep on saying, like -- I did develop more than 50 Unitys. I can’t tell them apart, because they’re Unity No. 1, Unity No. 2 -- where do you get it? But there are enough breakups in the period, you know. But when I say Hommage to Gold, I know what I’m talking about, you know. Or if I say Coronation I know what I’[m talking about. Now remember, you know, these paintings go places I may never see them again. JH: And there’s the Big Bend series. LB: There’s the Big Bend well, the Big Bend series cam e out of the experience of Big Bend in Texas. And another thing came out of that: the dark-light paintings for which I’ve done few. But I think I may go back to at one point. Because when you deal with light, you’re also concerned with darkness. And there -- do you know Big Bend at all? Ever hear of it? LB: Well, it has the appearance of the way the world might have looked on the day of creation. So, what a place to read the Cabala, and I had a book on the Cabala. I’d read the Cabala but enough of it for it to take place in my head. And one of the notions is the notion of the origin of life concept of life emanating form that darkness. The Cabala itself is referred to as, oh, black fire on light fire. And there are other things about the Cabala which are magnificent. I think it’s an ultimate statement of human faith. But there I had the sense of looking into some of these darknesses and the feeling that out of that containment there was this source from which I wanted to derive, you know, I felt a mystery, you know. But it was to find, hoping a reality. It was a felt thing. I hated the drink places. But here I’m concerned with light, but you know fascinated by death. So I wanted to bring light out of darkness and I didn’t know how to do it. I did about three paintings which are in that series -- I call them the ES Series. The high meaning. They’re like two letters. I know what they mean. LB: ES, for eye and soul. They’re two different letter, eye and soul. But people seeing ES One and ES Two they don’t know what it means. That’s what I mean by hiding, you know -- hiding my meaning. Or when I did the AM One which is -- did I show you AM One? JH: I don’t think so. JH: No, I didn’t see that. LB: AM One. AM we will think of as meaning, like, one o’clock in the morning right? Or it could be the first day, or it could be analyzed in any one of those ways. What is means is, after Monet it was the first painting I did. LB: I saw the Monet show in New York. LB: And then I came back with that, you know, deep feeling about his colors and his light. JH: I wondered if there were other artists besides Vermeer who’d had an influence on your art. LB: Well, of course China and Chinese painting had a great influence, early on. Lu Chee was one of the classical Chinese It’s tikversinnen and is actually a kind of model for the kind of space that I came to realize. For years I would go back to it. Like I’ve been back to the feather and try to see why I was so fascinated by it, you know? We’re dumb! It takes us so long to realize what we can believe and what we think. You have to go back to things again and again and again. And as you develop, you know, then you come tot hat moment where you’re level with death, experience. That’s as it was with Vermeer. I never understood Vermeer. Everybody said, "He’s great." I said, "Sure, he’s great." But -- you know-- I didn’t know about ht notion f the pearl light for many years, until I came on the notion myself. And then I wanted to check and sure enough, he had it. So I think you grow in your experience to the point where you can recognize that other people have grown to that point. LB: Oh, Louis was an important person to me. There is nothing of Louis left in me now that I can recognize. Louis once looked in on me, came to my studio. He poked his head in the door, and said, "I know what you’re interested in. Fragility with strength." And he chuckled. I wanted to rediscover form but I wanted to discover it out of the of Nature. And then, to realize, form that discovery of form, how Nature makes its forms. So, when you talk about form, and the thing is like time. "Hey, look." Now, you see, there’s time isn’t it? LB: That measured change. The pace of the light. three becoming one, you see. LB: Whenever there’s an episode, that episode changes in a kind of constant way. It’s like variations . But it holds a single experience. I wonder if she ever saw that other triptych? JH: That big one?? That one?? I doubt it. LB: Show it to her. I’d like her to see it now, because -- since I’m talking about time. LB: I can’t, I told you upon records, you know, for now. So that’s the record. JH: This shows up on the video tape, right? LB: Well, it’s watching me paint a painting. And I talk sometimes. I don’t like to talk technique, because I don’t think that’s the purpose of the artist. I think each person should find his own. I’ve actually talked with a couple of people but they’re not artists, you know, they just -- I mean, I don’t want to be know as the guy who uses a particular technique; I mean that’s not the point Besides that, I want to then it become s part of a mystique, you know -- you’re exposed to the experience. I think it’s pointless to talk about technique. What I can, of course, say is that I use oil paint, and with a brush, and that I don’t spray, and I work with multiple layers of very thin oil pigment. And that I may use as many as 30 or 40 pigments, and each one is complete because there are no edges, you see it. And I have to dry each one thoroughly before I lay the other. And they are my materials, and I use hordes of turpentine. I make my dealer rich, buying turp! You ought to see that, it’s an interesting painting. That’s very recent, you know. There are some of these paintings which I haven’t wanted to let out. I’m having a show at the museum of South Carolina or somewhere, the museum of the University of South Carolina. But I’m not sending the new works. I’m not going to let them see it. JH: What are you going to do? LB: But you can imagine what goes on as evening begins to come on. And then every becomes so, so ... The colors darken. There’s constant change going on. This one -- I was listening to a Verdi opera, I don't remember which. And in depth -- in search of depth of light in a human voice, you know. And yet its soaring quality. And so it combines, in Verdi, you know, both the tragic with the exaltation. That can only take place in a very broad high state. And it can’t happen in a thimble. But people ask me, why did I paint so big. JH: And it was more apparent when you changed the light. LB: Yes, of course, of course. that’s that losing and bonding thing -- you know, I referred to that earlier -- about ht threshold of our visual perception. So it’s to go a little bit beyond and the, and then discover. But there are unites in it that help to ... Of course So, what a leap, over those years, form Spain! That’s what I was searching for. JH: It makes me wonder, like, where can you go from here? LB: I’ve been saying that for years! It used to scare the daylights out of me, but I’m not scared anymore. I’m not scared any more. Oh, a few years ago when the National collection of Fine Arts wanted to see my Cathedral, I said, "Gee, I can’t believe that, you’ve changed." She aid, "Oh no," she shad, "these are marvelous," she said. "Just do these." It was enough, for her. But then, you see, you can’t. LB: Because if this is an avenue for, you know, realization, for knowing, then the avenue continues, it goes on. And great art, like, well, Matisse, whom I admire -- Matisse, I mean, in comparison to Picasso, I would say he was more of an influence. Picasso I can’t stand. I can’t stand him because he in prison. You know -- black lines around everything? LB: And he seems to cut his forms with an axe. LB: Well, you see, this is what I mean, that you, what you -- you can’t hold anything tight, you know, to be in contact with it. You can’t. JH: I don’t remember where this story does come from, but how difficult it is to drink water with a clenched fist ... to be able to catch the steam and drink if you fists are closed. LB: Yes. You know, we look at the moon and we say, well, you know, it looks like cheese, or like somebody’s face, or something. And, you know, people have believed that. But it’s much more believable that when you hold your hands like that in the moonlight, if you lift some water from a lake and hold your and, theft he moon is resting in the palms of your hand. Just as much of a reality. And so when we say, well, this is real and that is real, and that is real -- they’re all real. But because they exist within us, and not because they’re made out of anything we call hard, cold facts. There are no hard, cold facts. And there are no bottom lines. These things I can’t tolerate. But . And I think these are strong realities. Not complete realities; very pertinent, strong realities. JH: In your psychology studies, did you get into the Jungian idea of the collective unconscious? LB: Oh, of course. Oh, I don’t know, I haven’t pursued it. What I have pursued is my experience. And I always regard things like that as parallels to my experience. So they’re what I call confirmations, or they’re support. They’re "Eureka!" experiences, you know. When somebody else like -- somebody that you really love and respect has formed your idea to -- Einstein has been someone that I constantly admired. For him, a truth had to be beautiful to be true. It wasn’t enough-- you know, he couldn't trust it enough. Because he had that kind of sense of life that it was whole. To say that life is whole is something beyond truth, believe. but without that belief, he couldn’t have perceived his theories. so it puts him on a level above the engineer-scientist, you know? The whole history of science is a very romantic history, really. It’s very unscientific. But -- yeah, the painting is for me a kind of responsive surface -- you know, responsive surface; not just for me but for others. It’s, you know, it exists because of my own sensibilities, all my senses, and my perceptions. I used to feel that the surface of a painting is like the surface of my skin. Because things that gibe life to my skin is the river of blood under it, the life under it. And it’s true. So that the surface of a painting is something which has that quality of tactility that a living person has. These are the kinds of things that I endeavor to incorporate into the kind of work I want to do. And it’s that -- you know, it has that quality. It’s very tactile. You daren’t touch it -- with your hands. JH: But you can wallow in it with your eyes. LB: You can! The Pool. I want you to see The Pool. JH: I’m going to turn the recorder off for that. Now this is called Pond? JH: You noticed it the first time I got up. LB: ... and experience of looking deep in the pond, as you look in the water. And just s I -- but then, the vertical style integrates well, even though it’s just a of a pool. It’s a continuation of But has to do with the notion of duality, which I’ve used before. And in a way it’ constant reference back tot the function. JH: Some of your earlier things were almost mirrors. JH: Do you think you’ll be the same person after today as you were yesterday? JH: If not, she knows it’s not the .. .
LB: Well, let’s not show her the next step. JH: Is there anything else that you’d like to add here? We’re just about -- oh, we have probably about five minutes. LB: Well ... Maybe what I could do, if we have five minters Well, I’ll read one of my lists. This is from a recent note: "Planes and straight lines do not exist. Physics cane denote the continuum. It cannot invent it. The high-frequency sound has always been there. The tonality is only pattern discovered in principle. The universe only alters itself in our minds. Creativity is a tunign into the universe and not to alter men’s minds." I ask you if you I’ve altered you mind, I hope. I’m to alter human minDs, as a life ambition. "A cat can experience gravity. It cannot express from that experience an objective or subjective pattern. The mind, the human mind, is a laboratory in which the experienced universe is shaped and projected. Great art always intimates its sources. "That’s one note. I’ve put in here things like, "That painting within the red" -- I called it, it’s now Coronation, I should include in your tape its title -- the Within the Red refers to the fact that the whole painting is contained within the redness. And it does deal with the levels which I was referring to before -- the levels of , as though each life is a curtain, and you enter into the experience by going through those curtains. But hen we all have to snap back to the surface, whether it’s red . I was working form different sources. My surfaces are centers from which I work -- form which the painting will grow ... I was working from different sources -- I mean, say, in different relation to earlier work. Now the sources are at different spatial levels. Instead of, let’s say, that concept of proceeding through the forest to the source of life -- that is, discovering within that life light -- let’s say, the point of its origin ... Anyway, the descending arc passed over the upward, rising arch you know, I have reference to the incoming tide and withdrawing tide vertical but it comes from that, form the whole scene in nature -- the red central source spreads over the blue source beyond and above. Do you see? So that the beyond, and the above, become another form of duality. This is down, and at -- I mean the pool. You see, I have ow had more and more situations to work with. JH: And instead of less and less. LB: And instead of a lot more. You see I trust ... They come to me, and -- because I’ve used my perceptions. Because that’s all we have. You know, I used to believe that, well, we were given, by Nature, all of the ability to meet and understand our experience. And that, somehow or another, were have no reason to feel deprived, you know? I think that there is an anxiety in man to withhold this capacity. That’s why -- you know, this whole notion of repression -- why do I have to stay within these limits? I have a little note there of a photographer who is almost blind. So that within a very small range of his threshold of visual perception, he does masterful work. Born in Philadelphia, Leon Berkowitz is best known as a Washington painter, having spent more than forty years in this city. Berkowitz studied at the University of Pennsylvania, the Art Students League in New York, and in Paris, Florence, and Mexico City. During World War II he was in the Army, stationed in Virginia, and in 1945, after completing his military service, he moved to Washington, D.C. He painted and taught art for more than ten years in D.C. high schools and later, in 1969, at The Corcoran Gallery's School of Art, where he was chairman of the painting department. He continued to teach there for almost twenty years, until his death in 1987. With his first wife, the poet Ira Fox Berkowitz, Leon Berkowitz established the Washington Workshop Center for the Arts in 1945. This Center became a cultural catalyst in the city, bringing together leaders in both the performing and visual arts, including painters such as Morris Louis, Kenneth Noland, and Gene Davis, who would later become well-known founders of the Washington Color School group. The Workshop Center closed in 1956, and Berkowitz and his wife spent much of the next decade traveling and living abroad, primarily in Spain and Wales. It was during this sabbatical from his life in Washington that his painting took a new direction, and it is this late work for which he is best known. By the 1970s, Berkowitz's paintings had become completely abstract, suffused with mists of color and light. 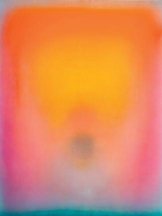 Though he was often associated with the Color School painters, he vigorously denied that connection, asserting instead that his floating washes of color carried light, and through light, a spiritual presence. And, indeed, the intense white ground used to prime his canvases radiates light, creating a luminous, color-drenched atmospheric effect. In a statement for an exhibition of his work at The Phillips Collection in 1976 he said, "I am endeavoring to find that blush of light over light and the color within the light; the depths through which we see when we look into and not at color." oil on canvas, 100 x 82" Although Leon Berkowitz (1911-1987) is associated with the Washington Color School, he had been traveling abroad for about a decade when a 1965 show gave a name to the D.C. school. He rejected any connection to the group's concerns, claiming that his work had more to do with nature and poetry. However, Berkowitz was instrumental in bringing together many of the artists who would form that group through the Washington Workshop Center (1945-56), a mecca for cross-disciplinary fertilization that he founded with hisfirst wife, poet Ida Fox. He accompanied Morris Louis and Kenneth Noland on a famous 1953 visit to Helen Frankenthaler's New York studio. Unlike his cohorts, he did not adopt Frankenthaler's "staining" of unprimed canvases with poured color or employ acrylics but, like them, he considered expansive fields of color ample content, emphasized two-dimensionality in his work and eliminated bravura brushwork. This exhibition of 10 large canvases (all oil, made between 1968 and 1986) was an engulfing experience of color as light. While two paintings from 1968 feature stripes, the majority of the works present mists of transitioning, super-saturated spectrum colors whose radiance seems equal parts existential affirmation and visual effect. layers erased the brushwork, he drew into the wet washes with oil pastels, making delicately deliberate marks that at first read as residue from the washes. The combination of washes and pastel results in color that's both highly pigmented and transparent enough to reflect maximum light from the primed canvas. Where Berkowitz wanted to diffuse this luxuriant color, he painted vapory passages of white, so that the color seems to burn like the sun through atmosphere. This effect is emphasized by two small orbs that seem to glow through shrouded orange, magenta and blue, and recalls the foggy, watery landscapes of Turner and Monet. “Abstract Art Goes to the Workshops”, London Guardian, May 9, 1963. Ahlander, Leslie Judd, “Preface”, Flowing Form, Museum of Fine Arts, St. Petersburg, Florida, 1973. Baro, Gene, “Forward”, The Unities; One-Man Show, Pyramid Gallery, Washington, D.C, 1972. Burton, Scott, “Color it Berkowitz”, Art News, March, 1969. Benbow, Charles, “Optical Gymnastics: ‘Color in Control’ Explored”, St. Petersburg Times, September 22, 1969. Washington, D.C. and the Chicago Arts Club, Chicago, Illinois, 1977. Berkowitz: The Sound of Light, Corcoran Gallery of Art, Washington, D.C. and the Everson Museum of Art Syracuse, New York, 1973, 1974. Coe, Marian, “Reaction Range: ‘Wow’ to ‘Whew’”, St. Petersburg Times, September 22, 1969. The Corcoran Gallery of Art, The Corcoran and Washington Art, Washington Art, Washington, D.C., 1976. Crumlish, Rebecca and Hechler, Timothy, An Afternoon with Leon Berkowitz, (video tape), Osiris Productions, Washington, D.C. and the Chicago Arts Club, Chicago, Illinois, 1977. Davis, Douglas, “Introduction”, Leon Berkowitz; Big Bend Series 1976, The Phillips Collection,Washington, D.C. and the The Chicago Arts Club, Chicago, Illinois, 1977. Davis, Douglas, “Newsletter,” Arts Magazine, Summer, 1969. Davis, Gene, “Starting Out in the ‘50’s,” Art in America, July-August, 1978. Dynamo,” The Washington Post, March 20, 1983. Drath, Viola, “Introduction,” Leon Berkowitz: Big Bend Series 1976, The Phillips Collection, Washington D.C. and the Chicago Arts Club, Chicago, Illinois, 1977. Drath, Viola, “The Master Artist: Leon Berkowitz”, The Washington Dossier, May 1977. Exhibitions Catalogue, The Aldrich Museum of Contemporary Art, Ridgefield Connecticut, Fall, 1972. Forgey, Benjamin, “Berkowitz Earns His Beard”, Washington Evening Star, April, 1972. Fox, Ida, “Three Poems on a Painting by Leon Berkowitz”, In The Wind, Antiphon Press, 1970. Frankenstein, Alfred, “Review” San Francisco Examiner and Chronicle, March, 1969. The Gallery Guide, Cover Story, New York, New York, 1969. Getlein, Frank, “Review” Washington Evening Star, Washington, D.C., November 1966. Hairthas, James, “Forward,” Recent Paintings by Leon Berkowitz, The Corcoran Gallery of Art , Washington, D.C., 1969. Harithas, James. “The Washington Painters”, Ringling Museum of Art, Sarasota, Florida, 1969. Kainen, Jacob, Leon Berkowitz, Watkins Gallery, Washington, D.C. 1953. Martin, Robert, “Artist as Colorful as His Painting”, The Tampa Times, February 24, 1978. Millet, Donald, “Berkowitz Paintings”, Pittsburgh Gazette, February 10, 1973. Muck, Gordon, Art Views and News”, Syracuse Post-Standard, March 4, 1974. Press, London, England, and St. Martin’s Press, New York, New York, 1978. The New York Times, “Hippies Crash Preview”, February 21, 1969. Press, Jacques Cottell (ed. ), “Leon Berkowitz, Painter” Who’s Who In American Art, R.R. Bowker, New York, New York, 1976. Gallery of Art, Washington, D.C. 1969. Portner, Leslie Judd, “Art in Washington”, Washington Post, December 9, 1956. Richards, Paul, “Catalyst for Color Painters” Washington Post, April, 1972. Ronnen, Meir, “Review”, Jerusalem Post, September 20, 1964. Ruhe, Benjamin, “Visual Arts: When You’re Hot”, The Washingtonian, Washington, D.C.
Schaff, David, “Notes on Leon Berkowitz,” Art International, February, 1978. Schjeldahl, Peter, “New York Letter”, Art International, September, 1969. Seagrave, Wendy, “77 People to Watch in ‘77”, The Washingtonian, Washington, D.C.
Secrest, Merle, “Attentive Introspection,” Washington Post, June, 1969. Secrest, Merle, “Light in Painting”, Washington Post, November 27, 1969. Smith, Kenneth Coutts, “Review”, Arts Review, London, England, November-December, 1963. Tannous, David, “Art: Mysterious and Perspectives,” Woodwind, Washington, D.C.
Welzenbach, Michael, “Guiding Light”, Washington Post, December 21, 1984. Washington Theatre Guide, “Berkowitz”, Leon Berkowitz, Excerpts, Spring/Winter 1986. Lewis, Jo Ann, “Berkowitz: A Career in Color,” The Washington Post, May 4, 1985. Welzenbach, Michael, “Leon Berkowitz at Baumgartner,” The Washington Times, May 9, 1985. Rand, Harry, “Leon Berkowitz”, Arts Magazine, Summer, 1985. Power, Mark, “Berkowitz at Baumgartner’s” The Washington Post, May 16, 1986. Berkowitz, Leon, “Speakeasy”, The New Art Examiner, November, 1986. “Algonquit”, invitation, Baumgartner Galleries, May, 1986. Rose, Robin, “Electric Light”, Museum & Arts Washington, May/June, 1989.